Since Gunnhild was already long gone, I had to travel alone to the Philippines. When I came to the airport the airplane was already 3 hours late into Oslo, and it was a small chance that I would get on to the connecting flight. I only had 3 hours and 20 minutes between flights in Dubai. Everyone told us that it was a good chance since all airplanes to and from Dubai was delayed, so everyone kept up a good mood. I have never seen so few people at OSL. This was on new year’s eve, so a few hours after we were supposed to fly, there were less than 10 flights left on the departure screens. By chance I started talking to a nice girl from Gjøvik (Helle), that was travelling the same route to Cebu, Philippines. When we took off we were about 4 hours late. Since we were supposed to land in Dubai just before New Year we had to celebrate it aboard the airplane. The captain announced it, and we had a countdown to the new year, with following drinks. We landed in Dubai when my flight to Cebu was taking off. When the captain turned off the seatbelt sign, and we where standing up, I realized that Helle was sitting in the seat in front of me. We agreed that since both of us were traveling alone, we should try to tackle the airport together. That was a good plan, since the first customer service desk where packed. Helle went to ask if there were more customer service desks, and there were! So we kept on through security, and got to the next customer service desk. Here there were slightly less people, but still a mess. We somehow got to the counter in about 2.5 hours, to be told that the guy behind there could not find a solution for us, and that we where in a ticket line, not a customer service line, and that we might have better luck there. We went out of the line, and looked at the customer service line. Nothing moved. We found an Emirates representative, and she could tell us that the booking system was down, and that we were better off coming back in 2 hours or so. Our next question to the representative, was where do we find beer 🙂 She answered fast that the closest one had to be Heineken lounge, and we went there with a short pit stop at an eatery on the way. After a few beers, we went back to get some food vouchers. We got them and they told us that the booking system was up. After a short discussion about food or tickets first, we agreed to go for tickets. Then the long wait started, we were kind of happy, so we were laughing and smiling and giving out candy to the kids that were standing with their parents in line. After about 4 hours we arrived at the counter, and after another 30 minutes we where the lucky holders of 2 seats on the next flight to Cebu, arriving just 24 hours late. We found out later that others on the same plane with the same destination where on a waiting list, and had to wait at least 48 hours. We also got hotel vouchers and were looking forward to a shower. We should just go down to the baggage carousels and we would be off to the hotel, we thought. We were not that lucky. Since it was January first, there were no hotel rooms available in Dubai, so they gave us lounge access. Helle and I agreed since we only had about 15 hours left for our flight we will not go to a hotel, as long as we got a shower and some toiletries. The guy behind the counter lit up, at least someone he was not responsible for anymore. Since we where at the baggage carousels we had to wait for someone to take us through some restricted doors before we got to the security counters. From there we walked the entire terminal 3 at Dubai airport, after standing still for 4 hours. This was refreshing at first, but soon our legs hurt like they had never hurt before. We arrived at a non alcohol lounge with no hot food. We could at any time go to the reception and get a voucher for warm food and go outside and eat, so we had no complaints. After a hot shower and coffee, we decided to go for some hot food. On the way back we saw a shop selling whisky, and decided to buy a bottle. Now the day with the most laughing I have ever done started. Helle and I could not stop laughing, after a few hours we had finished the whiskey (sharing with some others in the lounge). So we went for another bottle. The next 6 hours were gone in no time. I think I have a new best friend! At midnight we left the lounge area to get to our flight at 02:45. We needed some hot food, and it was a long walk back to the gate. We arrived at the gate about 10 minutes before it opened, and got to our seats in no time. Both of us fell asleep immediately, and we do not know when we departed (probably on time). We arrived before scheduled arrival time, and went fast through immigration. Then it was the wait for our baggage. We waited for a long time and Helle’s backpack was at last on the carousel. She went out because she wanted to get a local SIM card, and I was waiting until the “last bag on belt” sign came up, and I did not have my suitcase. After some paperwork and ATM work, Helle and I left the airport only 24 hours late! One of the reasons we choose Egypt and the Red sea was the diving. It is famous for more than 1000 species of invertebrates, over 200 species of soft and hard coral and 1100 species of fish (more than 200 can only be found in the Red Sea). We went on a wreck tour (Famous five) with the Emperor Superior, a 37 meter dive boat with space for 25 guests, 2 sun decks, a large dive deck and spacious common areas. Our group consisted of 20 people, mainly from the UK, but also South Africa, Canada, Germany, Spain and Norway. A lot of the dive sites on the trip was quite deep, so 16 of our 19 dives were deeper than 20 meters. We started our diving with an easy check dive where we for the first time dived on our own without a guide. We started off with a guide, but decided to leave him half way into the dive since he had to sort out some problems with other divers’ gear. The rest of our time at the Emperor we dived without a guide, although we often stayed close to the guided group to benefit from the guide’s trained eyes and local knowledge. We had two dives on the Salem Express, one afternoon dive and one night dive. This is a controversial wreck to dive, since a lot of people lost their lives here. The passenger ship sank on her return journey from Mecca with up to 1600 people (mainly Egyptian pilgrims) on board in 1991, and only 190 survived. It was an interesting dive, but since we don’t have enough training we did not go inside the wreck, and because of that didn’t see much of the luggage and personal belongings still to be found inside. During the night we cruised out to the Brothers islands witch is a world famous scuba diving destination. It offers some of the best diving in Egypt and in Red Sea, but can be quite challenging due to strong currents and rough surface conditions. These 2 small Islands (Little Brother and Big Brother) are famous for their abundance of colourful soft corals and gorgonian fans and the rich diversity of marine life and large pelagics including sharks and manta rays. From the brothers we had a 12 hours journey to “Ras Mohamed National Park” on the tip of the Sinai peninsula. We did one dive, with beautiful corals, loads of small fishes, crocodile fish, scorpion fish and moray eels. The wreck (Yolanda) had a cargo of toilets, so there was a lot of them as well. Our first penetration of a wreck was at the Dunraven.The dive guides said it was a very easy penetration with lots of exits, so we went for it. Inside we did not see much, but Gunnhild spotted a nudibranch on the way out. We ended the dive at the nearby reef, which was very colorful and with loads of fish. In the afternoon the same day, it was time for SS Thistlegorm witch is considered THE best wreck dive in the world. There are 2 locomotives, 2 tanks, army trucks, jeeps, motorbikes, boots, stacks of rifles and various spare parts for planes and cars. Our fist dive on the wreck was a little crowded, but on the two next dives the crew made sure that we were the only ones on the wreck. We had one of our best night dive so far on this wreck, and the next morning we penetrated the wreck to explore 3 of the cargo holds. It was a very special experience! Dive number 100 for Fredrik was at Giannis D, a very picturesque wreck, due to the great visibility. It is possible to access the engine room, but because of a lot of stilt this was only recommended for experienced wreck divers. We enjoyed the blue spotted sting rays on the outside, and again spent the last part of the dive on the shallow reef nearby. Gunnhild started the last day with dive number 100 at Shaab El Erg, famous for dolphins in the passage between two reefs.We had a long and relaxed dive (our first over 70 minutes! ), and also saw two Red Sea Walkmen,a very strange scorpion fish using it’s pectoral fins to walk along the bottom. One dolphin swam by as we were surfacing, and we saw several from the sun deck after the dive. Our next dive at Umm Gamar Island was maybe one of the best of the entire trip. We saw lots of large stone fish, a very rare (especially during the day) Spanish dancer, a huge moray eel and again loads of colorful fish and beautiful corals. We both celebrated our birthdays on the boat, and the chef had made birthday cakes for the both of us. The entire group sang the birthday song, and Fredrik even held a short (slightly ironic) thank you speech. In addition he made a cake for a couple that got engaged on the trip (underwater proposal! ), and a shared cake for 5 people (including us) that reached 100 or 500 dives during the trip. Since we are not really that fond of cake, we had brought some other treats to enjoy on our birthdays; Norwegian craft beer and aquavite! After a week on a boat with wreck dives, we agree that corals and fish are more interesting than wrecks. Not that we don’t like wrecks (some of them were awesome), but we had our share for a while and will focus on other things on our next trip. Liveaboards on the other hand is something we will definitely do again. Living on a boat for a week, walking around barefooted, diving 3-4 times a day, meeting great people, relaxing on the sun deck, going to remote dive sites, learning so much from the dive guides and the other divers, watching the stars and the life in the sea around the boat, staying up late drinking beer and sharing travel stories, being exited to get up although you are tired because a great dive is waiting, eating great food, having someone to help you with your gear and put your fins on, warm cacao when getting up from a late dive, music, laughter and nice conversations. Gotta love it! Time for a new dive trip, this time to Egypt. We ended up booking a charter trip, since that was the only direct flights to Hurghada, and we got a decent hotel for a very good price. Just 4 days before our departure we got an email from the charter company saying that due to few bookings our return flight was cancelled, and we had to travel via Copenhagen the day before instead. Not too happy about that, but not much we can do (except get some money back). Our flight from Oslo to Hurghada was not full either. Less than 50 of the 180 seats were taken, so we had plenty of space. We arrived in Hurghada around midnight, were the first ones out of the airport and were happy we had pre-booked a shuttle instead of waiting for the charter buses. When we arrived at our hotel (Triton Empire Hotel), we were told that it was closed and that we were moved to the beach resort instead. We got a nice room with a view over the beach and the pool area. Even though it was quite late, we went to a bar close by (Debbies) for a few beers before going to bed. The next day we explored the resort area and the neighborhood. Our main goal for the day was to find a dive shop, and we stopped by a few different ones. We ended up booking 4 dives with Funny Divers who were very helpful, professional and flexible. We got the cash we needed for the next few days, bought beer and snacks for the boat trip, delivered our dive gear at the shop and packed the few things we needed for our next excursion, Cairo and Luxor. The next morning we got up at 4.15, and were picked up 30 minutes later and taken to the airport. We had a 6 am flight to Cairo, where our guide for the day was waiting for us. We had a large van all to our selves, and got a lot of information while driving through Cairo. The French president was visiting, so the main roads were decorated with flags and banners, but the traffic was luckily not too bad. We started at the Egyptian Museum, and were the first ones through the gates when they opened. The museum has more than 120000 items, including the treasures from the tomb of king Tut Ankh Amoun. Our guide showed us the highlights, explained a lot about the history and the culture, and thought us which signs and features to look for in statues and carvings to know what or who they represented. We were amazed by the details, and impressed by the condition of these very, very old treasures. The mask of Tut Ankh Amoun was one of many highlights. Good food and great views, but way too much to eat as always. At 1 pm we arrived at the Giza plateau, and had our first view of the great pyramids. Wow! They are the most substantial ancient structure in the world and still surrounded by mysteries. They were built over the span of three generations from 2575 to 2465 BC. The great pyramid of Cheops/Khufu is the only remaining Seven wonders of the ancient world. We also visited the Great Sphinx, a limestone statue with a lion’s body and a human head, most likely representing Pharoah Khafra. It’s the largest monolith statue in the world. Our visit ended at The Valley Temple, made out of red granite and used for the embalming process. As always we were quite efficient tourists, so when we finished we had a lot of time before our flight. We stopped by a papyrus factory for a short tour, and stopped for tea and coffee at a small coffee bar downtown. The plan was to eat dinner at the airport, but the airport was very quiet and all we could find was a couple of sandwiches and some Sakara beer. We arrived in Luxor quite late in the evening, and were again picked up by a guide and a driver. Luxor was small, cozy and very green compared to Cairo. We spent the night at a beautiful 5 star hotel with great views over the Nile, and were picked up again at 7.30 am. We had a short stop at Colossi of Memnon, a temple ruin currently being excavated, and where two large statues were restored. In Valley of the kings (no cameras allowed) we visited three tombs. Ramses IV was very colorful and Merenptah was very long, but the most interesting one was Horemheb which was newly opened for visitors. It was very steep and closed before it was finished. Here we could really see the different stages from stone cutting to carving and painting. Really cool! We visited Hatshepsut Temple, built for the queen that ruled as a king. Two of three levels were mostly restored, but a lot of the carvings were ruined by her stepson after her death, as a revenge for keeping him from the throne. We had an amazing lunch at Cafe Africa by the Nile, and went on a short cruise on the river in our own boat while crossing over to the other side (east bank). Nice! The final and maybe best stop of the trip was Karnak Temple. The complex is the second largest temple complex in the world(247 acres), after the Angkor Wat Temple in Cambodia . The temples were built over several generations of pharaohs (around 30 contributed). There were several large obelisks, lots of carvings on large pillars and walls and the colors of the paintings were still strong in certain areas. The drive back to Hurghada took 4 hours and we arrived at our hotel around 6 pm. It seems we ate something we shouldn’t have on the way back to Hurghada, because in the evening Gunnhild got sick, and Fredrik the next morning. Luckily it didn’t last very long, so we were still able to go on the two planned day trips with Funny Divers, but the energy level was not very high. We spent a lot of time between dives talking to a group from Belgium and The Netherlands, and it turned out that 4 of them stayed in the two rooms next to ours at Triton Empire. The dives were also very nice. We saw lots of Napoleon Wrasse, loads of giant moray eels, some beautiful nudibranches, bluespotted stingrays, cornet fish, crocodile fish, box fish and all kinds of colorful fish. We also had a filmcrew following us for a day, to take photos and videos for their webpage and Facebook. When we got back on the second day we had about 20 minutes to pack and get ready to be picked up for the liveaboard. Luckily we were almost done already, so we didn’t forget anything very essential. 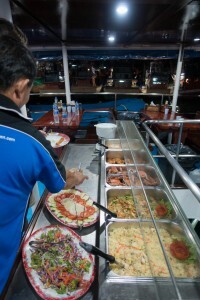 We stayed one night in Khao Lak, 60 km north of Phuket island, before and after our liveaboard. This way we could repack and only bring our dive gear and a small bag of clothes on the boat. We lived in a cozy hotel, Fasai house, just off the main road. The city was very quiet, and it seemed that most tourists in the area stayed at the various beach resorts. We enjoyed our time there, had time for some quiet shopping, found a relaxed German bar with some import beers, had a lot of great food (springrolls, satay and pad thai in particular), enjoyed some thai massage, had a local tailor fix a ripped bag etc. The hotel let us keep the room until our pickup at 6.30 pm, and after a short ride in an open truck to the pier we were welcomed onto our home for a week, Deep Andaman Queen. Most people were coming by car from Phuket, so we gathered on the main deck, getting to know the other guests while waiting for everyone to arrive. Several of the people we were talking to realized after a while that they were on the wrong boat though, but by 8 pm our group was complete, we were introduced to the crew and got ready to leave. The thai crew had decorated the bow of the boat for the good spirits, and as we left the pier firecrackers were going off to scare the bad spirits. Our group was quite international with 2 Norwegians, 3 Russians, 1 Dutch living in Switzerland, 1 American living in Japan, 1 Chinese, 2 Singaporeans, 1 Australian and 2 Americans living in China. The 4 dive guides were American, Australian, Dutch and Japanese (private guide). The evening was spent finishing all the paperwork (Myanmar visa, departure cards, dive certifications etc), setting up our dive gear, packing out a bit, getting to know the boat and have a few beers. The next 7 days we did a total of 22 amazing dives, both in Thailand and in Myanmar. We normally had to get up at 6 am, but instructor Tod had the best wake-up call ever, and knowing we were going diving it was actually not that hard to get up. We had some toast or a yoghurt, something to drink and a briefing in the saloon before we were ready to jump in around 7 am. When we got back up the chef had prepared a large, hot breakfast and we had a couple of hours to relax before our next dive, normally around 10 or 11 am. After lunch we had another dive, and normally ended the day with a sunset or night dive. And after that it was beer o’clock, shower and dinner time. What a good life! Our very first dive of the trip was on Koh Bon. This was a so-called test dive, where they see which level everyone is on, and try to create the best groups possible based on that. We were 5 people (the two of us + Tim, Al and Danny) who were both advanced and nitrox certified, and we were in Anne the Dutchie’s group. And what a test dive it was. After a nice start we hit strong currents, and were all low on air and pretty exhausted when we got back up. But we all passed the test, and stayed in the same group for the rest of the trip (except some minor changes on a couple of dives). On our second full day we had a chance to sleep in a bit. Breakfast was not until 9 am, since we were crossing the border to Myanmar and had to spend most of the morning getting through immigration. 4 Myanmar officials boarded the boat to go through everything, and a local guide stayed on the boat for the duration of our stay in Myanmar. On the way back to Thailand 5 days later we even got to leave the boat for an hour. It was a weird feeling to wear shoes (well flip-flops that is) again, and we all had a bit of sea legs. We did some tax free shopping and had a few local beers at Smile restaurant in Kawthoung. We had to do some changes to the original plan, sometimes because of currents or visibility, but the biggest change was that we had to skip Black Rock due to dynamite fishing, which sadly still happens occasionally here. We still got to dive a lot of great sites though: Koh Bon West Ridge, Tachai Pinnacle, Richelieu Rock, Pratong wreck and Bonsoon wreck in Thailand, and High Rock, Three Islets, North Twin, Shark cave, Square rock, Submarine, Rocky island, Stewart island, Cavern island, Dancer/Holy crab,Frog rock, Fan forest and Western rocky (cave + pinnacle) in Myanmar. Some of the dive sites had so much to see that we did several dives there, and sometimes we returned to a previous site for a night dive, which was a completely different experience. We hardly saw other dive boats our entire time in Myanmar, so we had the dive sites all to our selves. Awesome! We were a bit early to see manta rays and whale sharks, but other than that we got pretty much all we were hoping for and then some. The highlights would have to be the octopus changing color, the frog fish and last but not least our very first sea horse! Mantis shrimps, barracudas, cuttle fish, squids, rays and spanish dancers were also pretty cool. In some of the sites there were so much fish it was sometimes hard to see your buddy, and other sites had so many moray eels and scorpion fish we lost count after a few minutes. Tim brought a large camera, and was showing us a lot of small stuff we haven’t seen before, like different kinds of anemone fish, sea snails, nudibranchs, shrimps etc. We also got to do several cool swim throughs and caves, and test ourselves in a few more currents and surges. The swim through at Tachai pinnacle was absolutely gorgeous with large sea fans everywhere. On Stewart island there was a large swim through with a current taking us on a ride the last part of the way and at the end it really pushed us out and up over a wall. On this dive we also went in to a cave with currents going in all directions in the middle. Anne knew how to time it and went through while the rest of us were holding on to the bottom the best we could. Both Tim and Fredrik tried to get through, but were both thrown back by the currents, and we had to exit where we came in. On Cavern island we went into a large tunnel going into the middle of the island, and out an exit on the other side. Quite some surge and so much fish on the way out it was hard to see where to go. On Western Rocky there’s also a large cave, with a beautiful archway by the entrance and lots of large lobsters along the walls. Also our night dive at Three islets was totally crazy with movement absolutely everywhere. The boat itself was very comfortable. It had 9 cabins of different sizes, with room for in total 16 guests (we were only 13). Upstairs there was a saloon, where we had all our briefings, watched pictures and videos, looked up all the marine life we saw during our dives and relaxed when we needed some air condition. We had a large area with a bar and seating for everyone. This is where all meals were served, 5 per day (if you include the pre-dive mini-breakfast) and so much to choose from every time. On top there was a sun-deck with several sunbeds and some sofas in the shade, and this was also a good lookout to see dolphins and sharks swimming close to the boat. Downstairs in the back was a large dive deck, with plenty of room for everyone to get ready. The crew was so helpful putting our gear on, making sure everything was set up correctly and showering us with water if it got hot waiting in the sun. Tod usually played music while we were getting ready, and our group often had a little get-ready-to-dive-dance while we were waiting for the captain’s signal to jump in. The captain was really good at what he was doing and manouvered the boat onto the exact right spot every time. When picked up after a dive he “sucked” us right in to the ladders without having to swim at all. Impressive! And of course the crew welcomed us, helped us off with our gear, served fruit juice and at the late dives provided hot towels. In the evenings we were all hanging out in the seating area (and a bit in the smoking area in the front), playing music, sharing Norwegian aquavite and other drinks, talking, learning new languages, laughing a lot, sharing dive and travel stories, sometimes even singing and dancing. We were a great group and had so much fun! People are telling us we are getting older, but it hasn’t sunk in yet. We skipped the naps a lot of people took during the day (I’m sure the nitrox helped a bit as well), always went to bed last, had twice as much beer as the rest of the group (yes, the list got full and they ran out of our beer of choice) and were still able to be the first one’s ready on dive deck in the morning. The Thai crew actually named Fredrik “Number one”, and always allowed him to get first onto the boat when getting up from a dive. 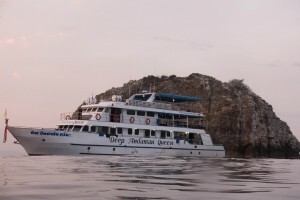 Today we will go on a liveabord named Deep Andaman Queen. This boat will take us to Myanmar water and back to Kho Lak. Arrival at MV Deep Andaman Queen in Tablamu pier. Welcome drink serves – Cabin allocation – Staff introduction – Boat briefing – Welcome Dinner – Leave from Tablamu Pier travel overnight to the fantastic dive sites of Similan. Enjoy with 2 dives at Koh Bon and Koh Tachai then follow by 2 dives at the Richelieu Rock. After diving will have a night cruise to Ranong for immigration on the next day. In the morning we will clear border formalities at Ranong-Thailand and Kawthoung in Myanmar before cruising out towards islands of Myanmar. Exploring 3 dives at High Rock, Rocky Island and Shark Cave areas. 4 extremely exciting dives at the Black Rock. Happy dives at North Twin, Shark Cave and Stewart Island. Morning dive at North Rock then follow by Fan Forest Pinnacle and 2 more dives at Western Rocky. Two dives at Western Rocky then returning to Kawthoung for checking out from Myanmar and back in to Thailand. 2 wreck dives at Boonsung and another wreck in front of Khao Lak. We arrived in Bangkok in the afternoon. The official taxi line was very long, so we went for an unofficial one. The taxi driver did not know where we where going, but luckily Gunnhild had saved the location on Google maps and could guide him. The hotel (Playhaus) was a theatre themed hotel and we got the Aladdin Room with an Arabic theme. In the room we had a bathroom with mostly (but not all) frosted glass. Luckily there were curtains! Other than that it was a great hotel with the best bed we had so far on this trip. We chose this hotel mainly because it was close to many beer pubs like BREW, HOBS (House of beers) and Mikkeller. We also found a place named CRAFT with 40 craft beers on tap when looking for a tailor. In these pubs, they had a lot of beer that we had tried before, but also a descent amount of beers new to us. We expected Bangkok to be dirty, noisy and way too warm, but was pleasantly surprised, so instead of going to Kanchanaburi as planned, we booked two extra nights in Bangkok. This way we could see the city and get everything in place before the liveaboard (laundry and some shopping) without stress. We didn’t do a lot of sightseeing while in Bangkok. Because of the river festival it was very crowded near the main sights, and getting around was quite hard. Sky train, metro and speed boats were the best options, but with just a few lines and limited transfer options, this took time as well. rinks to boats passing by. We also passed several temples, shrines, restaurants and schools. It felt like a different city, and was a nice break from the busy streets. Our boat ride ended close to Wat Pho (the temple of the reclining buddha), one of the largest temple complexes in the city. It is famed for its giant reclining Buddha that measures 46 metres long, 15 meters tall and is covered in gold leaf. It was squeezed into a building just large enough to cover it, and was a quite impressive sight. The rest of the temple was also nice, with lots of buddha statues and some funny looking Chinese statues guarding the gates and buildings. We skipped Temple of Dawn which was being renovated and Grand Palace where the dress code was too strict (we didn’t bring any shoes!). We have seen our share of Asian temples and palaces on previous trips though, so one was more than enough. Our last night in Bangkok started at Cloud 47, one of very few casual rooftop bars where flip flops are allowed. We had dinner, a couple of drinks and enjoyed the sunset and the views. The rest of the evening was spent in the bar CRAFT, where Italian brewery L’Olmaia were launching their beers. We had a long talk with the head brewer and his team, got a guided tour in the back of the bar and spent the night talking to the owner and his friends and tasting a lot of good beer. After a quick lunch and a beer, we went to the dive shop we had been emailing with (Hidden Depths) to book diving for the next day and agree on the Nitrox course we had booked. Gary and Jo were very welcoming and flexible, so we were really looking forward to the next few days. We ended up watching the PADI video as soon as we had all the paperwork sorted, and went back to the guesthouse with a lot of theory to read. Both were very hard to get through with jetlag and no sleep on the flight, but we didn’t really have any rush, so we just postponed the exam one day. As part of the training we also went to the filling station, where the German owner explained how they were mixing and filling enriched air, and we analyzed and marked the cylinders we were going to dive with after the exam. Hidden Depth’s speed boat was currently out of the water for maintenance, but they had agreements with the other diveshops, and we could pretty much pick between all available trips from the island. We loved being diving gypies, moving from boat to boat (always with our own guide from Hidden Depths though). They were all quite similar, and served breakfast, fruit and lunch on the boat. Most of them left from piers just next to ours, which was very convenient, but our favourite boat, Kon-Tiki, was worth the short drive. Awesome service, dark bread and delicious pancakes. We had 11 dives in 5 days: Koh Haa Lagon, Koh Haa Yai, Bidah Nok, Hin Bidah, Kled Gaew wreck, Bidah Nai, Hin Muang, Hin Daeng, Koh Haa Neung, Hin Yung and Hin Klai. We had great visibility on most dives, 30 degrees water and saw a huge variety of marine life. No manta rays or whale sharks, but the over two meter long leopard shark was pretty cool. We saw several cuttle fish, scorpion fish, turtles and moray eels in all sizes, loads of snappers, trigger fish, trivalies, glass fish, longfin bannerfish, moorish idol, scribbled filefish, andaman sweetlips, yellowback fusiliers, yellow boxfish, spotted boxfish, masked/common porcupinefish, trumpetfish, cornetfish, clownfish, shaded batfish, barracudas and lion fish. Banded sea krate (sea snake), durban dancing shrimp, peacock mantis shrimp, flounder, nudibranchs, stingrays, bigfin reef squid, red tooth triggerfish and a bamboo shark. The first day we had divemaster Erica all to ourselves. This was the first time we really were able to test our new dive gear, and after some minor adjustments we are both very happy with it! The rest of the week we were diving with instructor Dave as our guide. One day we were joined by freshly certified Sam. She was great though, so that was no problem, even though she told us afterwards that she got a bit stressed when hitting a thermocline with low visibility. After that we were joined by Vivian and Trevor, both instructors on vacation. We stayed together until they were headed back home, had a lot of great dives, many laughs at the boat and also spent several evenings together. On Koh Haa Yai we dived into some cool, quite large caves with swimtroughs connecting them. In one of them we also saw a huge giant puffer. Koh Haa Neung is famous for a series of vertical swimtroughs and caverns known as ‘The Chimney’. We entered one of the shallow entrances head first, had a short stop in the central chamber at 8-9 meters and exited at around 18 meters. At the end of the dive we took the other way through the chimney and ended up in a cave called the fish bowl. Fun! Another highlight was the trip to Hin Muang (purple rock) and Hin Daeng (red rock), which are bearly breaking the surface 40 nautical miles south of Phi Phi. Beautiful colors, loads of marine life and the reef was in a much better condition than closer to the coast. We also had a nice wreck dive just outside Phi Phi. The 47 meter long vessel was originally the Norwegian Ms Norfest (1948) and commissioned into the Royal Thai Navy in 1956 and renamed. The ship was donated and purposely sunk via controlled explosion to create a new dive site on 19 March 2014. It was impressive how much marine life had “moved in” in such a short time. We also did our first Nitrox (enriched air with 32 % oxygen) here. Didn’t really feel much of a difference, but had more energy in the evening which was nice. Most of the evenings were spent in Saladan where we lived. All along the water there were restaurants with large terraces over the water, and we also found some nice places in the main street. We even had time for some shopping, a rash guard for Fredrik and new glasses for Gunnhild. The first days it was very quiet, but suddenly on Wednesday a lot of people arrived. It was warm (28-32 degrees Celsius), very humid and mostly sunny. A short rain shower in the evening was just refreshing. The last evening before Vivian and Trevor left, we took a Tuk Tuk to Relax bay, where also Dave joined us for a few beers at the relaxed Fusion bar. We were sitting on pillows around a low table, enjoying the sounds of the ocean and the bonfires on the beach. Some of the local boys showed off their fire spinning skills, and we were talking, laughing and having a wonderful time. So good actually, that by the time we were ready for dinner, all the restaurants were closed. We went back to Fusion and they arranged great local food, and later in the evening a private car to take us home. Great night! We didn’t use the balcony at our hotel as much as expected. During the day, it was way too warm in the sun, and in the evening we were invaded by a monkey trying to steal our swimwear, drinks and whatever he could find. He also loved licking our windows. Funny guy. On Saturday it was time to leave Koh Lanta for some days in Bangkok. We picked up our dive gear that had been drying in the dive shop, said goodbye to all the great people we had met, packed our bags and waited for our pickup to the ferry terminal. The speedboat to Phuket was a bit delayed, but with 3×250 HP it only took 1,5 hours, including a short stop at crowded Phi Phi. We spent one night in the old town of Phuket Town, mainly to repack our bags and store our dive gear etc instead of bringing it all to Bangkok. Gunnhild got a haircut while Fredrik was waiting in an expensive wine bar across the street. The evening we spent in Brasserie Phuket, which had a nice beer selection and a great waitress very eager to learn more about beer. About 20 hours after we started we arrived in Koh Lanta, Thailand at 3 pm. The travel was smooth and on time, but there were long lines for the passport control both in Oslo and Bangkok, so we didn’t have much time to spare. We were picked up at the airport by the guesthouse owner, Manus. The drive from the airport was supposed to be a 1 hour drive plus 2 ferries, but it ended up being more than 3 hours all together because we where waiting for more than an hour on the last ferry. Too bad the bridge they are building will not be opened until February. Koh Lanta is a small island south of Krabi, and we are staying in a city named Saladan where most of the dive shops are located. We are staying in a small guesthouse at the end of the road (Lanta MP Place). We have a large room with a big balcony, and great views over the palm trees to the beach. The city is quite small, so everything is within walking distance, and the dive shop (Hidden Depths) is just 2 minutes away. We have booked the room until Saturday, but we haven’t really decided where to go next. Probably Bangkok and maybe Kanchanaburi. The friday the week after we are boarding a liveaboard cruise from Khao Lak (north of Phuket), and will spend 8 days diving outside Phuket and in Myanmar. Hardly any boats go to the dive sites in Myanmar, so they are quite untouched, and there will probably not be any other boats there at the same time as us. Since we will do a lot of diving, we will probably not update the blog every day, but try to write a summary when we move to a new location. Based on our previous experience with crossing the border between Nicaragua and Costa Rica, we booked a private car to the border, and planned on just finding a taxi on the other side to avoid waiting. But when we got to the border the lines were incredibly long, and the only way to get through faster was to be part of a bigger group. Too bad, so we waited in line for two hours. We teamed up with a Dutch couple and shared a taxi with them to San Jorge dock. We planned on arriving there in time for the 2.30 pm ferry to Moyogalpa, Ometepe, but just made the second to last ferry at 5 pm. This was going to San Jose instead of Moyogalpa, but San Jorge was dirty and full of annoying flies, do we just wanted to get out of there. The sun set just as we left the dock, so the ferry ride was very dark. We didn’t know how long the journey was, and didn’t really see any lights from Ometepe until we were basically at the dock. We took a taxi to Moyogalpa in the dark, and were looking forward to some light the next morning. In the evening we walked the quite short main street in Moyogalpa (the second biggest city on Ometepe with around 3000 inhabitants), booked a trip for the next day, had a couple of beers, waited a long time for a small, reheated lasagne, watched another Christmas parade and had a short chat with two Norwegian travellers sitting on the table next us. 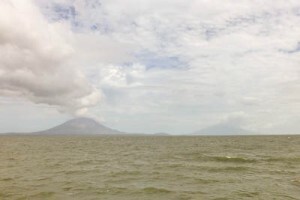 Ometepe is an island formed by two volcanoes (Concepción and Madras) rising from Lake Nicaragua. We have climbed enough volcanoes this year (but will probably be ready for a few more next year), so we visited four easily accessible sites instead. 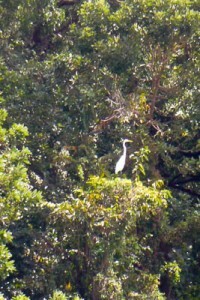 In the Ecological Reserve of Charco Verde we had a nice 1 hour walk in a tropical forest surrounding a lagoon. There were lots of lizards everywhere, and butterflies in all kinds of colours. We heard a lot of birds in the trees and between the reeds in the lagoon, but mainly saw stilts and several orakas (blue jay family). Our next stop was at Al ojo de aqua, a natural spring where we went for a refreshing swim and enjoyed a beer while watching the kids (and some adults) jumping from a rope swing. 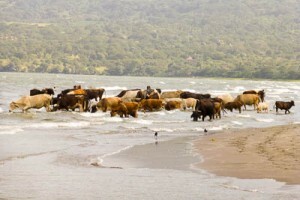 After a lunch break we had another swim at Playa Santo Domingo, a beautiful 4 km long sand beach, popular among tourists, locals and domestic animals (a herd of cows were drinking from the lake when we arrived!). It was a special feeling to have sand bottom and waves and in a fresh water lake. Really nice! On our way back to Moyogalpa we stopped at Punta Jesús María, a narrow spit of land formed by water currents and sediments. We walked along the sand bank a few hundred meters, and got great views towards the two volcanos of Ometepe Island. In the evening we booked a shuttle for the next day and walked around the city a bit more. We found a lovely pizza place a block away from the main street hassle, so we had dinner and a couple of drinks there. On our last day we enjoyed a slow morning, had a large breakfast, did some shopping (running out of sunscreen again!) and had plenty of time before the 12.30 pm ferry. We were picked up by our driver Francisco at the San Jorge dock, and had a nice (but warm, no AC) 2 hour drive to Managua. We even had a quite long conversation with him in our tourist Spanish, discussing our travels so far, where to go next and things we saw along the road. Since we have a very early flight out of Nicaragua, we booked the hotel solely based on the distance to the airport. We didn’t expect anything very fancy based on the price, but when we arrived it turned out to be a 5 star hotel with tennis courts, a spa and a swimming pool, and our room was very large with two double beds. The biggest luxury was the shower though, hot water AND good pressure! Haven’t had both at the same time in a month! We got a free welcome drink and after some blogging (best internet in a month as well) we had a great dinner and went early to bed. 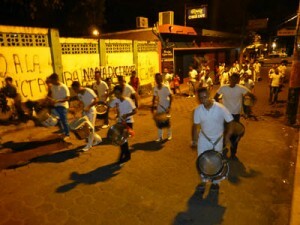 We arrived in Guayaquil in the afternoon and had to stay the night before continuing to Nicaragua. We had a terrible taxi driver from the airport (luckily it’s a very short drive), and he dropped us off about a block from where we were staying (Re bed and breakfast). We had a little trouble finding it, since it was located in a normal apartment building, but when we got up we were very pleased. We had been upgraded to a large room with 3 beds and a private balcony, and a lot of space (especially compared to our cabin on the boat). We had a walk on the Malecon, a wide pedestrian area along the river. We hardly saw any tourists, but lots of local families were enjoying the play grounds, Tivoli rides, christmas decorations and concerts. 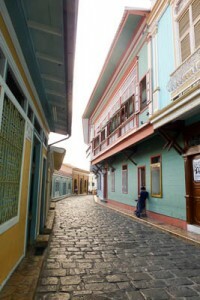 In Las Peñas (where the city was founded) most of the city’s colonial buildings are found. 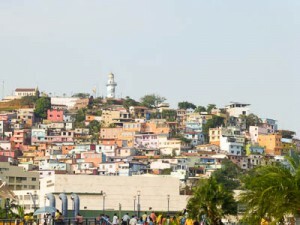 This was a peaceful and beautiful area, with renovated and colorful buildings (most of them built in wood), and in the background Santa Ana and El Carmen hills, with more colorful houses and a lighthouse at the top. We tried to find a micro brewery or at least a pub selling something more interesting than industrial pilsners, but most bars and restaurants were closed. After dinner we went back to Re, where they had craft beer in the fridge and stable internet. Just what we needed. We had decided on where to go next on the flight, and booked a hostel in León. When we left for the airport at 6 am, we found breakfast bags waiting for us in the reception. Nice touch!